Spiritual Spectra will offer a variety of workshops and events throughout the year. The events listed below are our ongoing and special events, for other one-time events please check our Calendar. 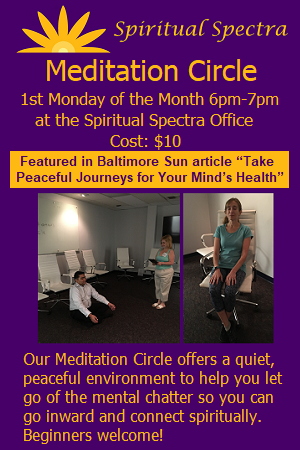 Our Meditation Circle meets on the 1st Monday of the month from 6pm-7pm. Click here for more information. Messages from Spirit, a Group Psychic-Medium Reading Event, meets on the 2nd Monday of the month from 6pm-7pm. Click here for more information. Spiritual Spectra presents a Wellness Talk Series offering talks on current health issues, holistic wellness, and more. Our Wellness Talk Series will feature doctors, holistic wellness practitioners and others professionals who aid in the wellness of others. Click here for more information. All the above events are held at the Spiritual Spectra Office 5457 Twin Knolls Road Suite 300 Columbia, MD 21045. Spring Cleaning, dusting off more than cobwebs! Time for renewal & new possibilities! Join us at Pathways Magazine’s Natural Living Expo April 7, 2019, stop by Booth #53 for tarot & medium readings! Sign Up for Health Tips & Info!